The ArduCopter GoPro specific 2 Axis camera-mount is finally here, with this mount you can easily add your GoPro camera to your multi rotor ArduCopter QuadCopter or HexaCopter. 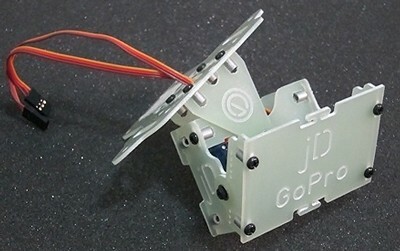 This mount needs a separate mount plate(not included see links below), with these mounting plates you can use this mount on all jDrones ArduCopters kits and frames like Tri, Quad, Hexa and all future kits. This GoPro camera mount is a great choice for your video shooting needs. This mount was inspired by the work done by Jakub in Poland. All necessary fiberglass plates for the main body (please note the mount plate is not included, see links below). Custom made lock nuts for easy mounting. Ball bearings for smooth operation. GoPro HD Hero 3 Camera Silver Edition. GoPro HD Hero 3 Camera Black Edition.